AFL -> Australian Rules Football. It’s not a sport I know a great deal about, other than its existence, and it being traditionally popular more in and around the state of Victoria – Eastern Australia tends to prefer Rugby League which is a sport I’m far more familiar with, having grown up on the edge of the M62 Corridor in northern England and listening to commentaries of teams like Wigan, Warrington, and St Helens on the radio. It’s also not a sport that’s known about much in the UK as a whole. The BBC Sport website doesn’t even mention it as a separate concept (unlike ‘American Sports’, Taekwondo, or Archery), and it’s almost never broadcast on UK TV or radio. One short-lived broadcaster (I have a feeling it was Setanta) did show a few games once, about 10 years ago, but I only caught one of them. It didn’t seem all that interesting to be honest – a procession of thrown passes which, when caught, caused the game to stop and people run into place further up the field. It seemed quite ‘bitty’ and not all that fluid, or really that interesting. That said, I’m always open to new experiences, and an entire country can’t be completely wrong, so when my friend Shelly suggested we go to a game while I was visiting her, I of course said yes. Often these things are much different if you’re there watching live, especially if you have someone next to you telling you what’s going on. As mentioned earlier, Australian Rules has historically been centred around Melbourne – indeed for much of its existence the league itself was known as the VFL (Victoria Football League) – and despite forming in 1897, it wasn’t until 1982 that a team outside the state of Victoria entered the competition, and that only because existing club South Melbourne moved themselves to Sydney. These days the league has expanded across most of the country – indeed in 1990 it changed its name from VFL to AFL (Australian Football League), and only the Northern Territory, Tasmania, and the Australian Capital Territory lack a top-flight team (and no-one really cases about the latter! ), although teams from Victoria still make up more than half the AFL (10/18). Though there are no AFL teams in the NT (and given its small population, probably never will be), it’s a very popular sport up there – estimates of between 12% and 18% of the entire population of the NT play in some form, and the stadium in Darwin has hosted at least one AFL match a season. 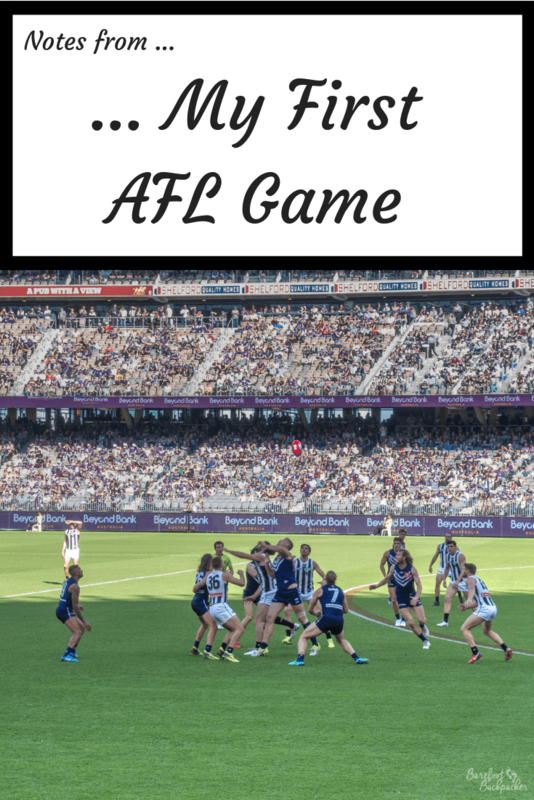 The game I attended was in Perth, Western Australia, and was my friend’s team Fremantle Dockers playing against one of the many teams from the Melbourne conurbation – Collingwood (the ‘Pies’, short for ‘Magpies’ as they play in black & white). To give an idea how popular the game is even here, the Perth Stadium (Optus Stadium, if you believe in the concept of naming rights) holds about 60,000 people. 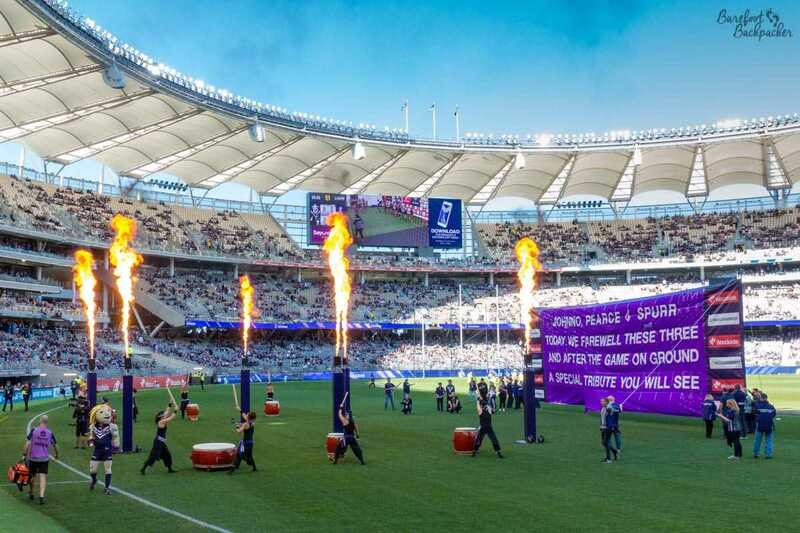 Now, granted, Freo games get only around 40k, and the pitch for AFL is the same as a cricket pitch so multi-use stadia are commonplace, but still 40,000 people isn’t to be sniffed at – its on a par with football (soccer) in the top two divisions in England. The new Perth Stadium, just after the game. 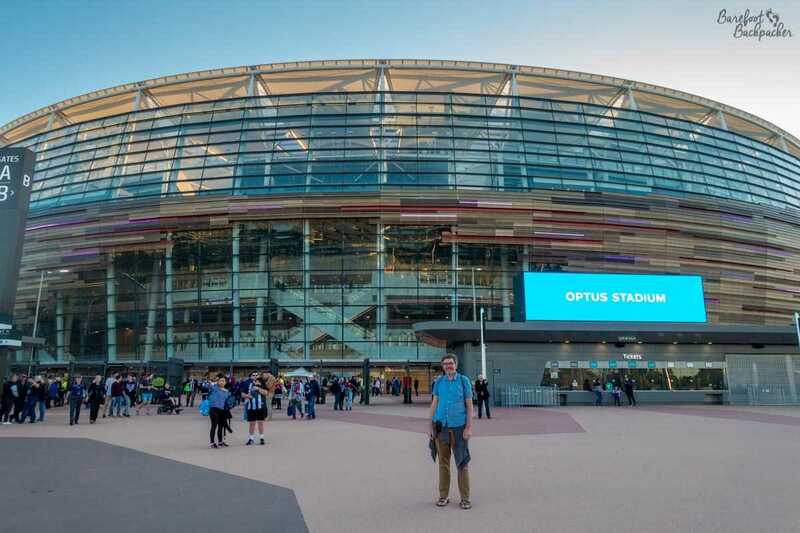 The stadium itself is pretty new, and dominates the surrounding area in the Eastern suburbs of the city of Perth – while there is a stadium (it’s got stands! It’s not a mere delineated area of a park!) 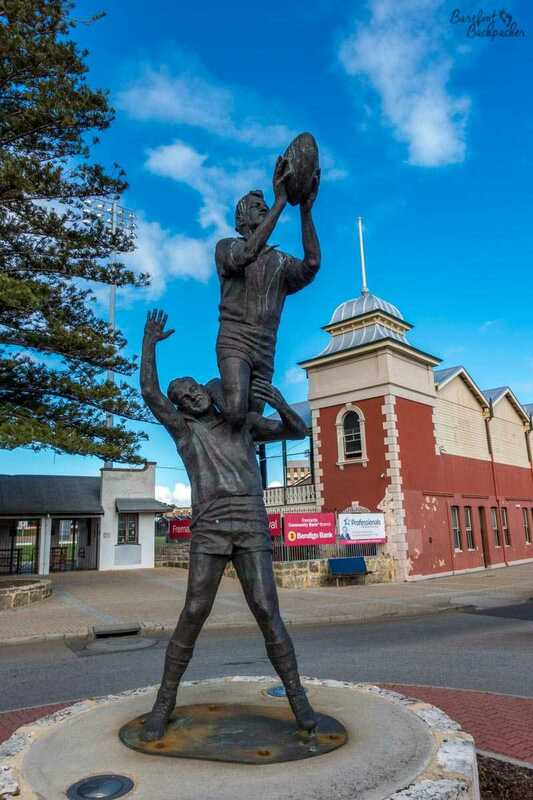 in Fremantle town centre itself, it’s used by Fremantle’s Women’s team and one of the lower league men’s teams. 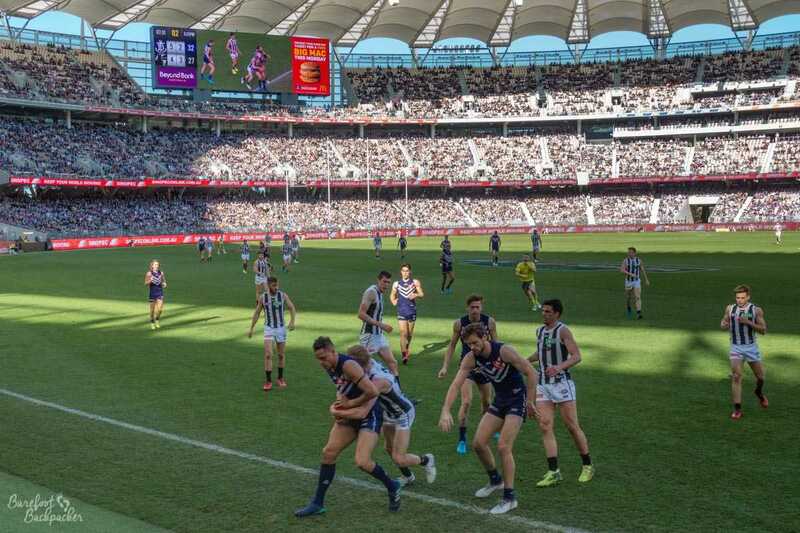 The Perth Stadium is shared with another AFL team, the West Coast Eagles, and there’s a bit of a rivalry between the two – a match between them a few weeks earlier was still being talked about on my visit due to a fight that took place on the pitch. View inside the New Perth Stadium, about half an hour before the start of the game. Our seats were right at the front, and next to the tunnel that players go down at the end of every period of play. This gave us pretty good views of the action close to us, but meant the far side of the pitch was tricky to see. Not to worry, there were big screens at each end showing the action – apparently the biggest stadium screens in the Southern Hemisphere. It also showed the time elapsed in each period – what it didn’t show (but does on the TV broadcast) was the reverse; how much time was left. Each period, or quarter as there are four of them in a game, is 20 minutes, but that’s ball-in-play time like Rugby, not overall playing time as in Football – this means towards the end of a tense game, when the final period clock is showing 25 minutes, you see people frantically texting home to people watching on TV to enquire how much time is left! That’s how close I was to the gameplay. The play itself … I spent a lot of the time in my mind comparing it to rugby and thinking how much better it was. In fact, it’s a little weirder than that. When I was a teenager, and going through a fantasy adventure period as most teenagers do, for role-playing-game purposes I created my own planet, complete with history, politics, and even sport. The global sport I imagined this planet having was a game which resembled football, but where you could use your hands as well as your feet, but which felt like football in terms of gameplay rather than rugby which always seemed a little too ‘restrictive’ (a sport where you can’t pass the ball forward seems remarkably weird to me). After watching this AFL match for about 5 minutes I realised that the sport I’d tried to invent in my head in the late 1980s was in fact pretty close to Australian Rules Football. There didn’t seem to be that many complicated rules – no ‘offside’, no pointless scrums (Rugby League, I’m looking at you here), like football there’s no passing restrictions making the game flow very fluidly – and despite having arrived not having a clue how the game worked, it seemed very easy to pick up. 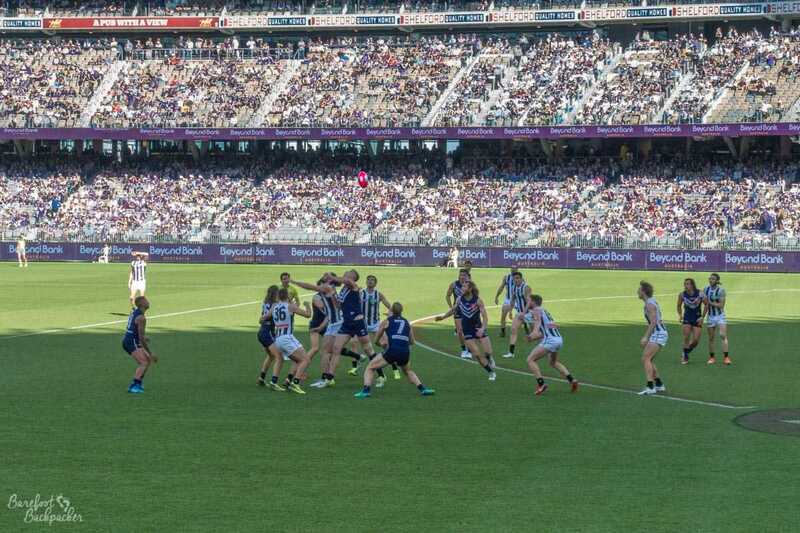 Fremantle in blue, Collingwood in the stripes. A few specific observations though. Like rugby, there are no goalkeepers, but like football, the aim of the game is to kick the ball between a set of posts. There’s no crossbar either, so it doesn’t matter where you kick it as long as it goes through – which may explain the lack of goalkeepers as the posts are several metres high. There’s actually two sets of posts, but you get six points if you kick it through the middle set and only one point if it goes through the sets either side – to the extent that the crowd barely notice the one point scores. Gameplay. Note both the size of the scoreboard and the goalposts in the background. Not only are there no goalkeepers but, given the seeming lack of any kind of offside rule, there’s no real hard-and-fast structure either. Obviously some players will be better at, say, kicking the ball through the posts than others, and some other players will be better at tackling, but in general it feels like, once you’re on the pitch, you can go and play anywhere. This feels like it adds to the ‘fluidity’ of the game. 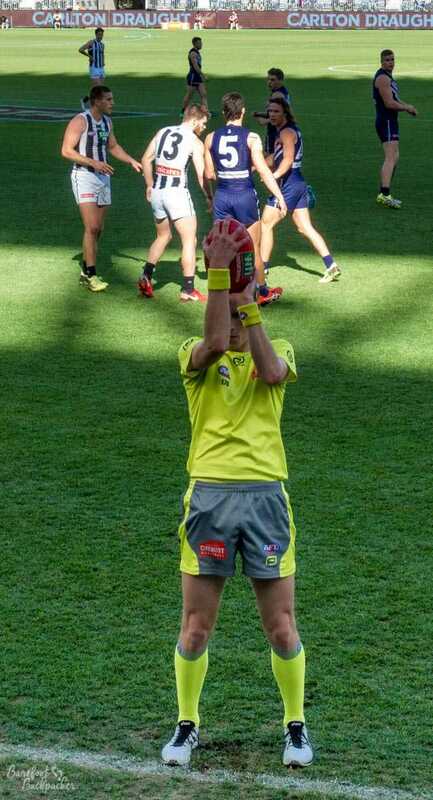 One of the Umpires throwing the ball into play during the game. One of the most alien things though is with regard to the ball going out of play. The ball is thrown back in, but not by a player, but one of the line judges. In essence, throw-ins/line-outs are ‘team neutral’, so there’s no advantage to be gained by forcing one. Oh, and as to my initial fear of the game stopping every time someone catches the ball, this is a ‘mark’ and it’s a very important part of the game. Rugby has them too, but far less often. They only happen if the ball is caught cleanly (ie doesn’t bounce first or come off another player), and then only if the ball travels more than a certain distance (15m). Also, much to my relief, the ball is then played on pretty quickly, and while a passage of play that consists of ‘marks’ is possible, I didn’t see more than three in a row in the whole game. Conversely, a well-taken ‘mark’ in a good position is the result of a great pass to a player in a great position, and leads the way open to an easy scoring opportunity under little pressure – you make your own luck. 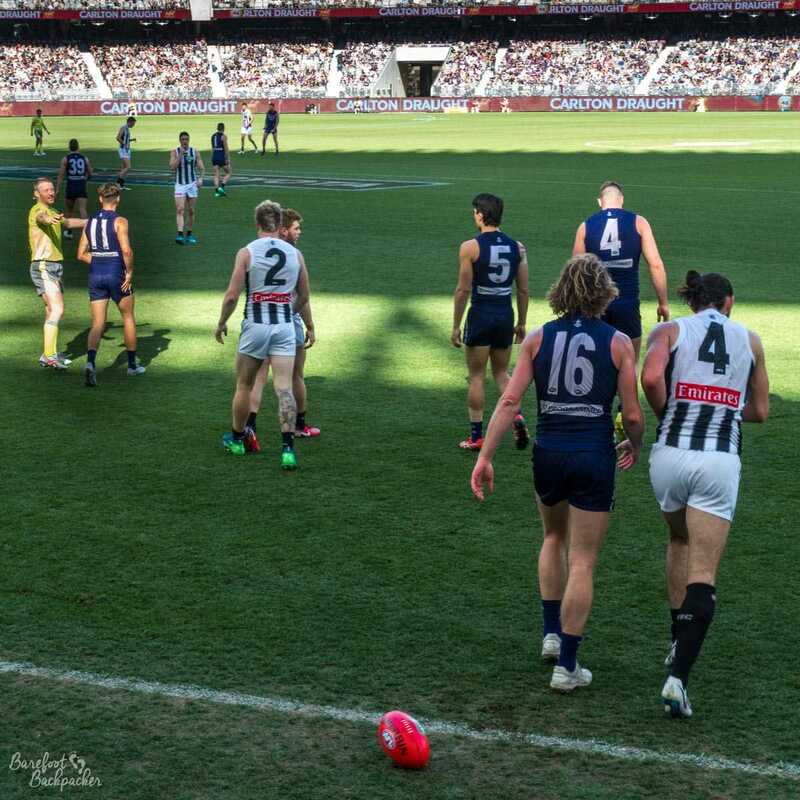 The match ended with a close victory for Collingwood – given they were third in the table at the time and Freo were about as mid-table as you can get, this probably wasn’t an unexpected result. 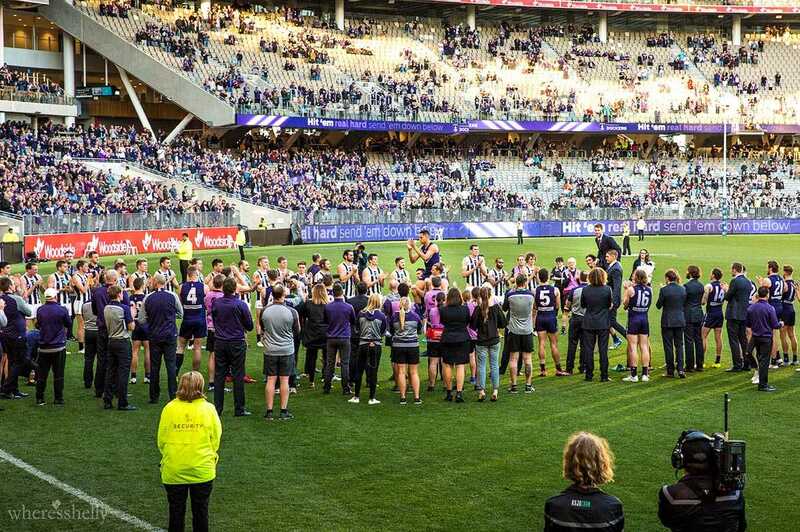 It being the last match of the regular season though, there was a lot of fanfare and stuff, including a send-off to a couple of Freo players who were retiring, which was nice to see. Pre-match entertainment and celebration; the banner refers to the retiring/departing players. Guard of Honour for two retiring players – Michael Johnson (front) and Lee Spurr (back). Notably, Michael Johnson is one of the many aboriginal players in the game. Picture by Shelly Tonkin because she has a better camera than I do. It was a great introduction to the sport, I have to say, and it was more interesting and enjoyable than I’d expected. It’s much better than rugby union, and more fluid than football. It’s not that popular or big in the UK, though my subsequent research has brought up that Nottingham have a men’s team in the 5-team “Central & Northern England League” and a women’s team which finished 5th in the 2018 AFL Europe Women’s Champions League. The game seems to be bigger in London, unsurprisingly. But I’d say definitely give it a shot when you can, you’ll be pleasantly surprised!